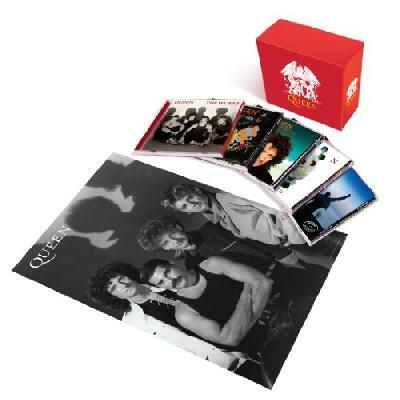 Queen 40 Limited Edition Colle.. Product weight is 1.37 lbs. Being the 2nd reviewer for this set, and having read T. Fleming's enthusiastic post, I will now ministrate to my respective side of the hydrant.Ten years ago, I opted for the Queen catalog in Japan mini-sleeves, which I believe had Japan-dedicated remasters. I never heard any of the artifacting in the Toshiba discs that Mr. Fleming speaks of in the European releases. So, please remember as you are reading this, I do not have the domestic Hollywood or European releases, only the Japan discs: If you do not ..
BOB (LOS ANGELES, CA) -.. If you've been listening to the original late-1980s EMI imports of the first five Queen albums on cd, this is the ultimate remaster or reissue to get.It's obvious the band & the label have gone all out on this edition of these classic Queen albums. The audio is crisp and deep - the quiet passages are actually QUIET instead of being filled with hiss and digital noise like on the original EMI imports. More to their credit, they didn't mess with the mixes, song lengths, or do any of the other shenanigans tha.. I recieved my Box Set Yesterday and spent most of the night listening to everything. Today, I listened to all 3 versions of Queen II that I have. The '91 Hollywood Records release, the Crown Jewels release, and the 2011 Remastered release. There is a slight increase in volume, but not overly done. I felt that the '91 version was slightly flat compared to the 2011 release. I can only compare the versions that have been officially released here by Hollywood Records. With that being said, I found that the chan..
boingoinsane - See all ..